The 2017/18-winter season will not be forgotten about any time soon. Being my first winter season made it even more special, and this report from my final outing of the winter easily makes it into my top 5, so far! I keep telling myself it has taken me over two months to get this report compiled because I want to do it the justice it deserves. 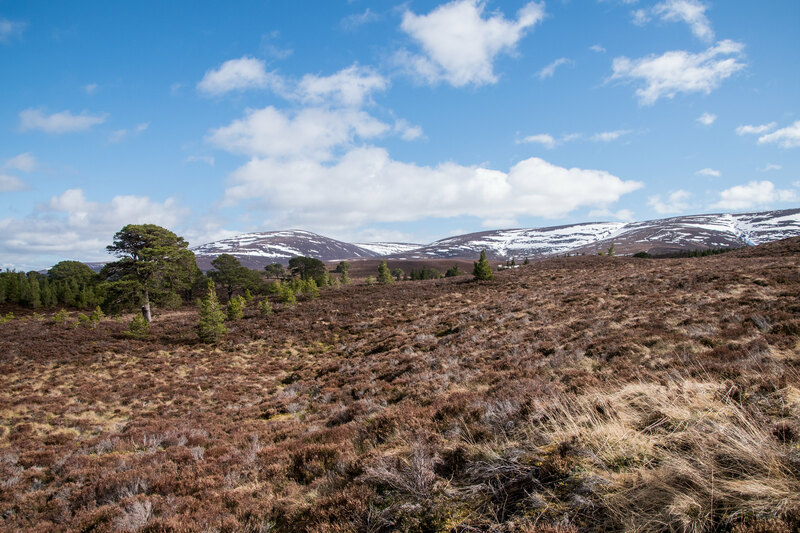 Truth be told the weather in May has been sensational so every free weekend I have spent creating a further backlog of Walk Reports to get through. However, nearly turning 25 my memory is starting to fade so I better get this finished soon! 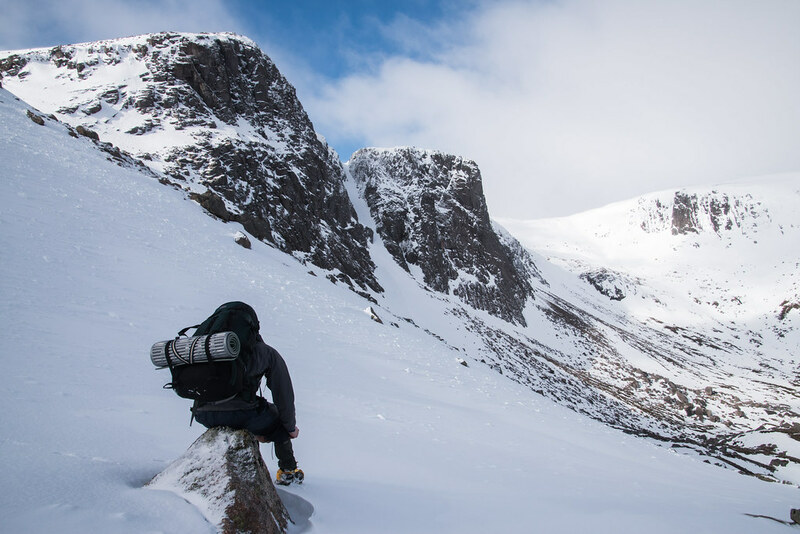 “Andrew Cubed” from our earlier winter camp on Ullapool’s Beinn Dearg had now been reduced to the two of us, Andrew Squared if you’d like… but the end goal was remained no less extreme (relatively extreme for us). 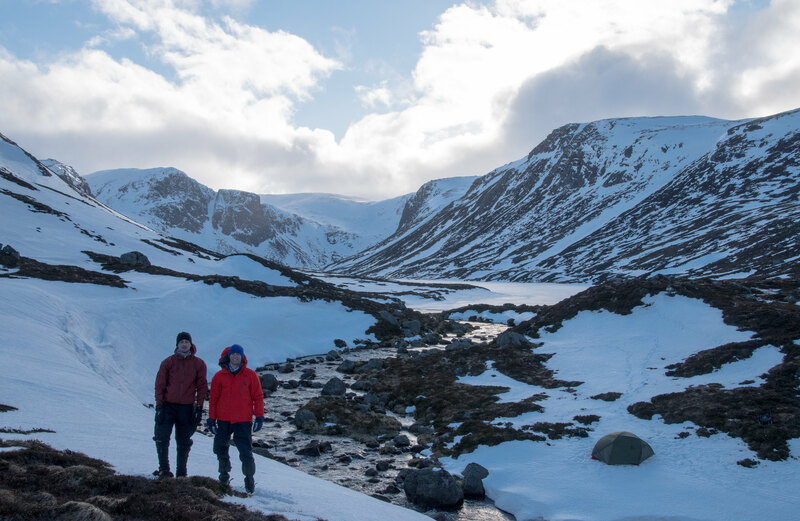 We set off from Glenmore Lodge on Saturday lunchtime with the goal to get another winter high camp and a couple of milestones smashed. All going well I would hit my 100th Munro summit and Andrew would be reaching double figures. 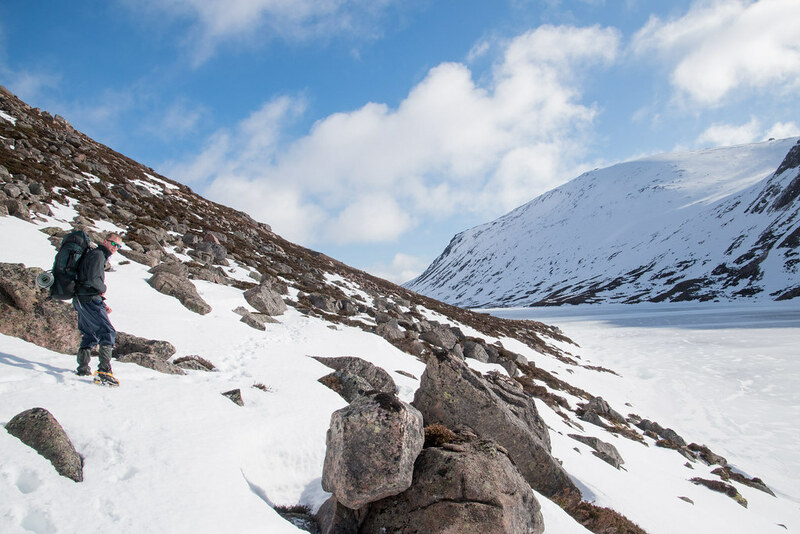 Saturday’s high level plan was the straightforward ascent of Bynack More from Glenmore Lodge before dropping down to Loch Avon and setting up camp for the night. 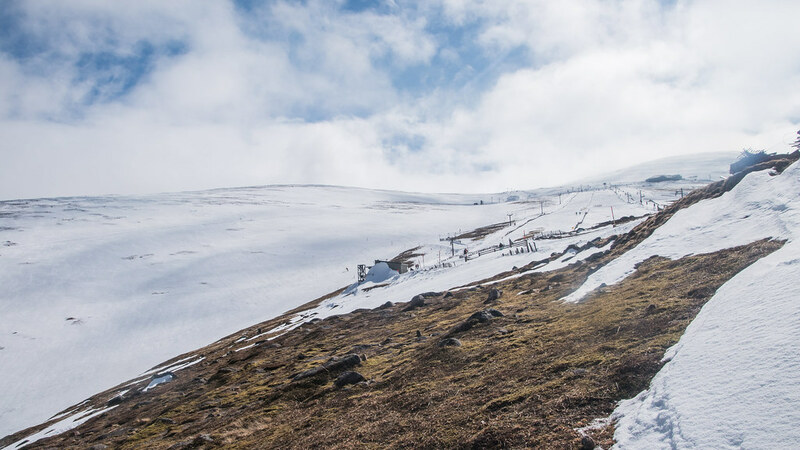 Sunday consisted of getting up Beinn Mheadhoin in the morning, leaving Cairn Gorm for Sunday mid-day, before returning for the long walk down through the Ski Centre back to Glenmore Lodge. 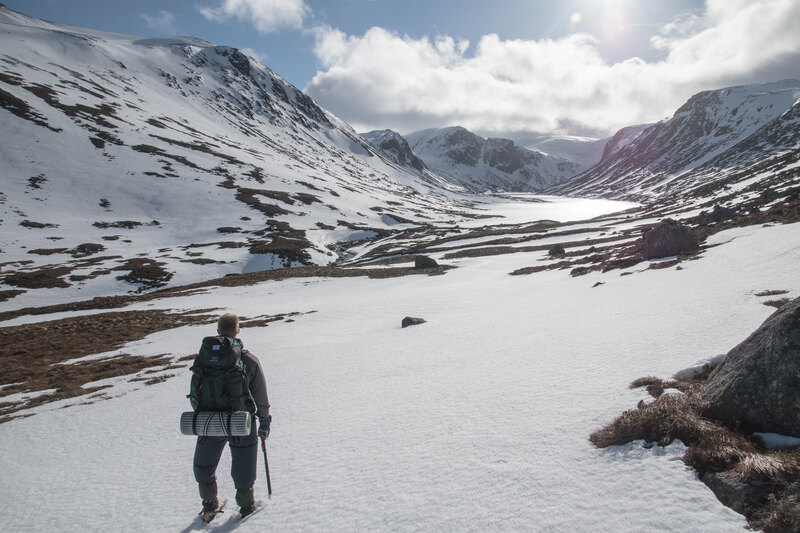 The walk in was beautiful and the snow was pretty scarce on this side of the Cairngorms. Our progress was slow but we had the luxury of not being in too much of a rush so this did not prove too worrying. Looking at the photos of Bynack More for the first time, memories of how much I struggled is flooding back. Impossible to blame this on a poor breakfast or lack of lunch but something just was not happening in my energy system! Possibly carrying all the winter kit was a factor but we made remarkably slow progress up Bynack More. 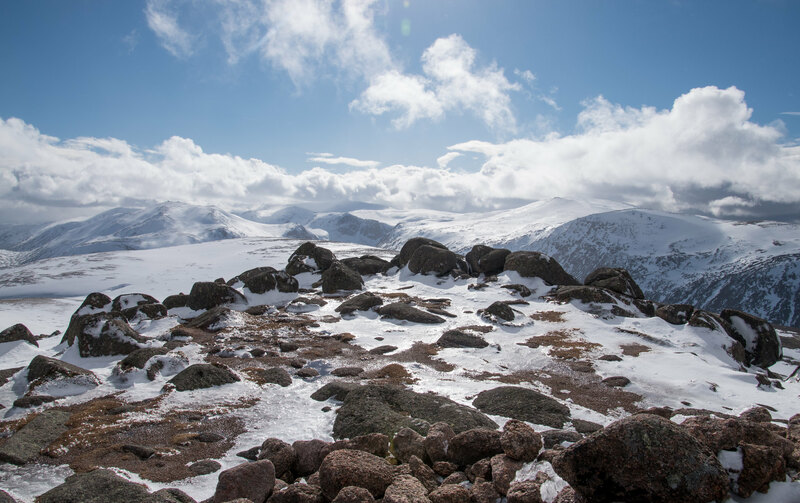 The views from the top of Bynack More were breath taking – for the first time we got a proper glimpse of the Cairngorms still holding their full winter coat with utter grace. The walk down from the summit of Bynack More was rewarding because we knew every step was a step closer to the views of Loch Avon, which had up to this point been completely hidden. 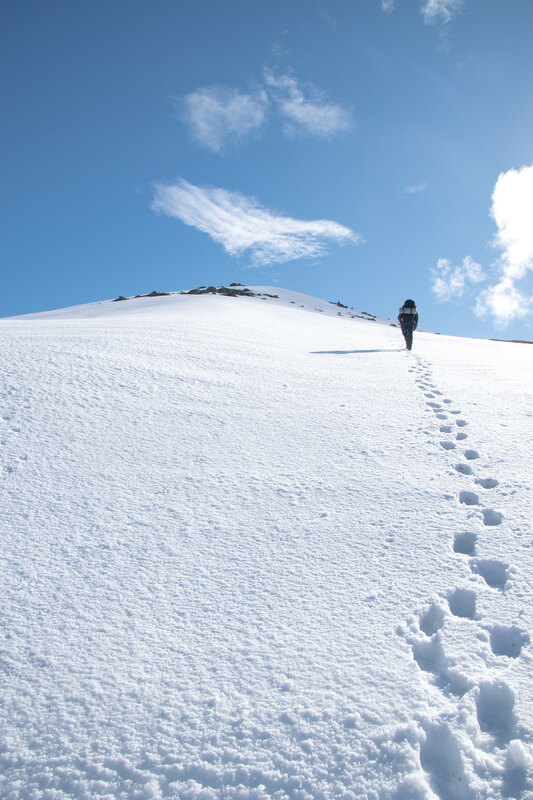 Unfortunately each step was not an easy task as the snow with the beaming sunshine was unable to even begin to hold our weight. 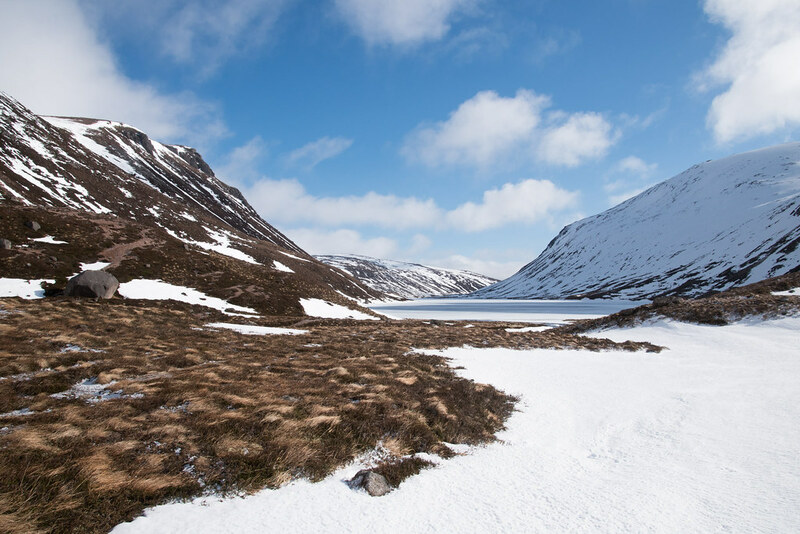 I am unable to recollect any other time out in the hills where one feature has finally revealed itself and been as impressive as the frozen Loch Avon did this particular Saturday. 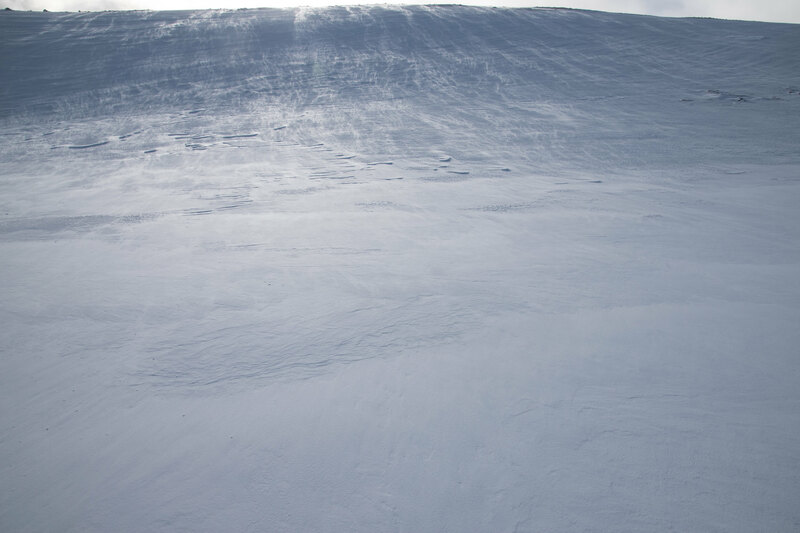 The weather was holding out just as forecasted and all we now had to do was find a suitable spot to pitch the tent. The weather higher up was good but a bitter wind convinced us heading down to Loch Avon level was the most sensible decision. We spent a good period of time trying to find the perfect camping spot. 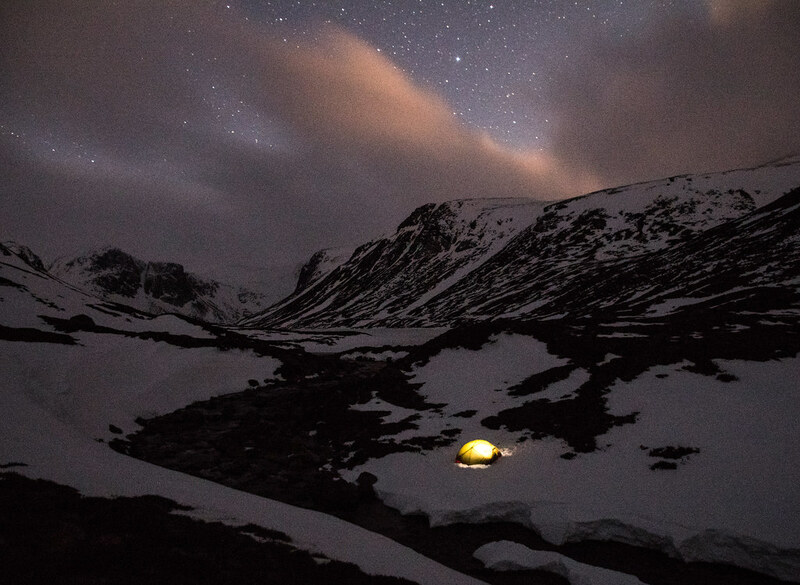 In reality this was a luxury we did not have from our last winter camp where it would not be too much of an over exaggeration to say getting the tent up quickly on Beinn Dearg was for survival not comfort. Tent all set-up and ready for dinner! The weather was also looking likely there would be a small cloud free weather window so I made the decision to lug the tripod – heck what does another couple of kilograms matter with these 75L backpacks?! After a good suggestion from Andrew I pitched the tripod, lowered and protected with some small boulders before leaving and going and getting some dinner. The route to the tripod involved crossed the medium sized flowing burn heading out from Loch Avon. Thankfully there was a thin, but solid, in appearance, section of snow holding steady above the flowing water. Crossing this in the daylight was easy enough, but everything looks more sinister in the pitch black. My tent is a MSR Elixir 3 man and I bought it for more comfort when travelling to the Outer Hebrides. 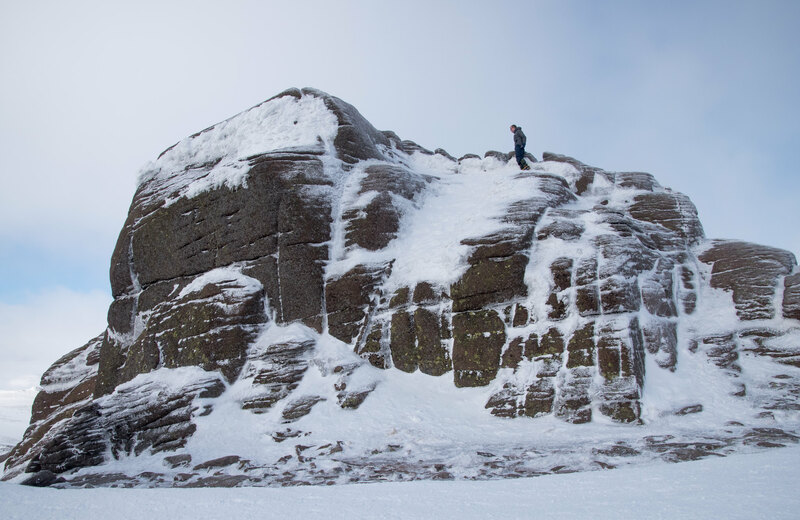 I did not envisage this being pitched in the depths of the Cairngorms when the weather is substantially below freezing. The tent held up well given the horrific overnight conditions up Beinn Dearg and this in comparison was a walk in the park. With only 2 of us in the tent it was far easier to set-up, locate kit and most importantly reduce the condensation. Now that I have done two winter camps I will look to get a more suitable winter rated tent to add to the collection – I mean a; 1-man (ultralight); 2-man (before I realised it weighed a lot! ); 3-man (used for this outing); and a bivibag surely are not enough for one person… I love kit! 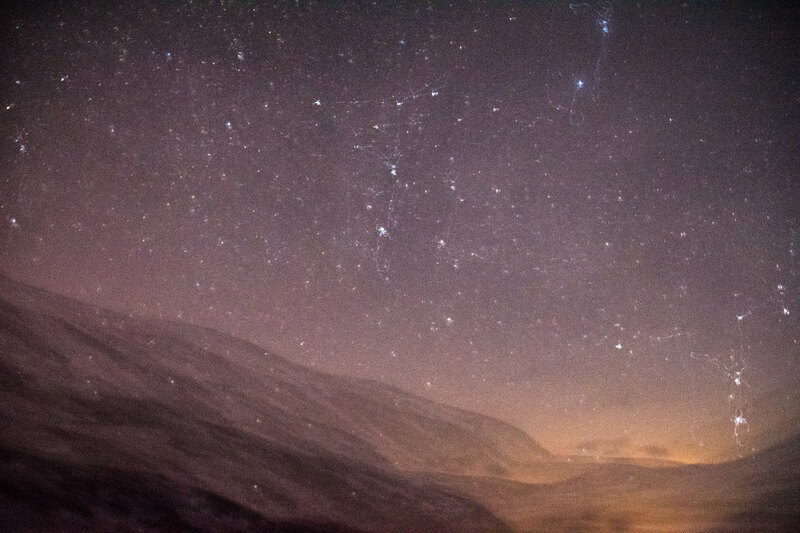 During the night it was cold, but a different kind of cold from Beinn Dearg, I think the temperature may have been lower but the wind was far less, and there was less body heat in the tent. I was comfortably warm but my face was freezing even with buff and balaclava. When my watch alarm went off at 2 I was actually exciting to get up and build up some heat attempting to locate the tripod. I am trying to get better at astrophotography but it is far more difficult than first expected. 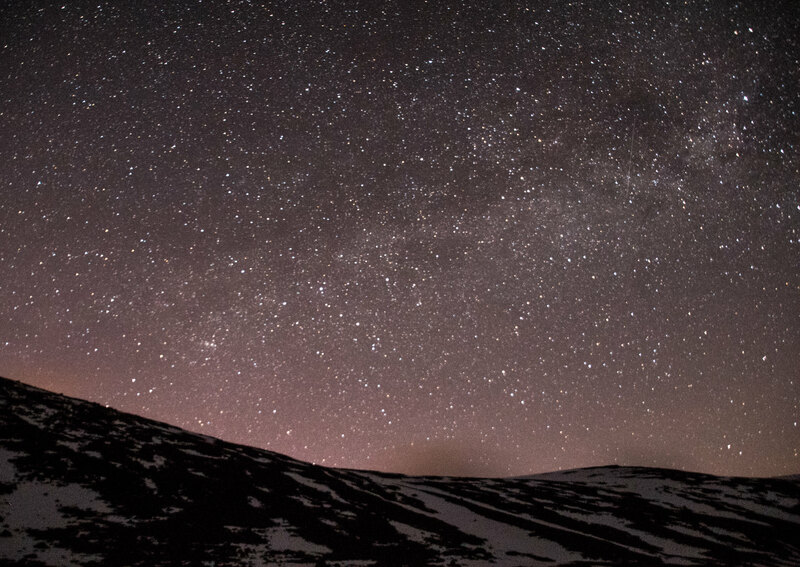 Unlike taking pictures of a dog or a human or even the hills in the day, you have to wait for the pitch black, no moon, no clouds and minimal wind – these conditions are rare in Scotland (as I have found out!). Additionally at 2am in the depth of winter it is cold, very cold. My fingers barely work, it is pitch black and with no internet signal impossible to check the settings are correct. As a work-around I have started to take numerous post-it notes of various recommended settings and then pre-set the camera before heading off to sleep. Only downside is with a small screen on the camera you inevitably do not get to see the outcome until you have uploaded the photos back onto the computer. Accidentally knocked my camera but liked the odd outcome! #modernart? After another couple of hours sleep the alarm went off and we got ready to set off for what we knew could be a long day. 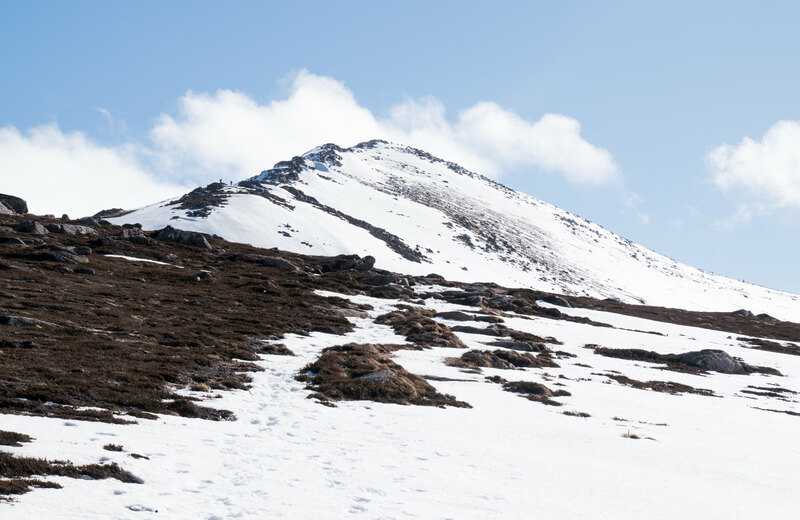 The climb up from Loch Avon to Beinn Mheadhoin was always going to be a challenge. 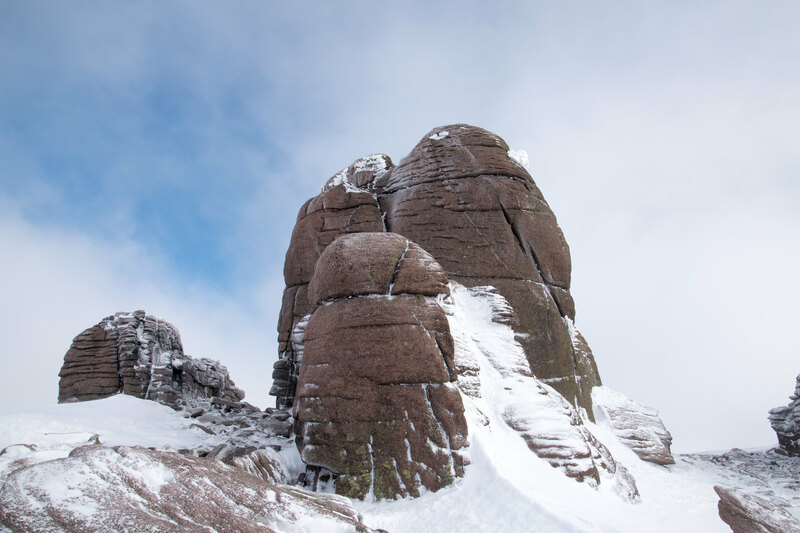 We then had the uncertainty of whether of not we would be able to successfully scramble up the granite tor of Beinn Mheadhoin. 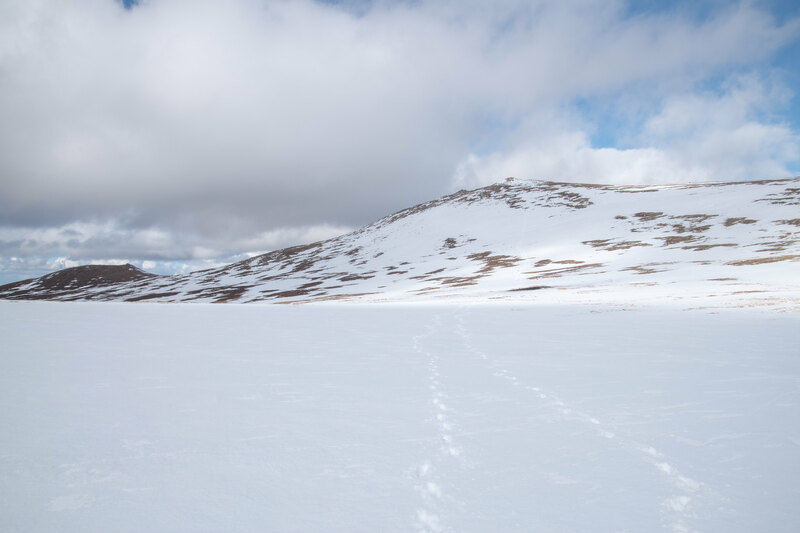 The final real challenge of the day was going to be getting back up from the opposite end of Loch Avon to the summit of Cairn Gorm. Morning progress & some windy snow! It was a tiring slog up the side of Beinn Mheadhoin but we had made pretty good progress and the granite tor was now in sight. This summit would by my 100th and Andrew’s 10th – what a spectacular way to hit these milestones, assuming we could actually scramble up! 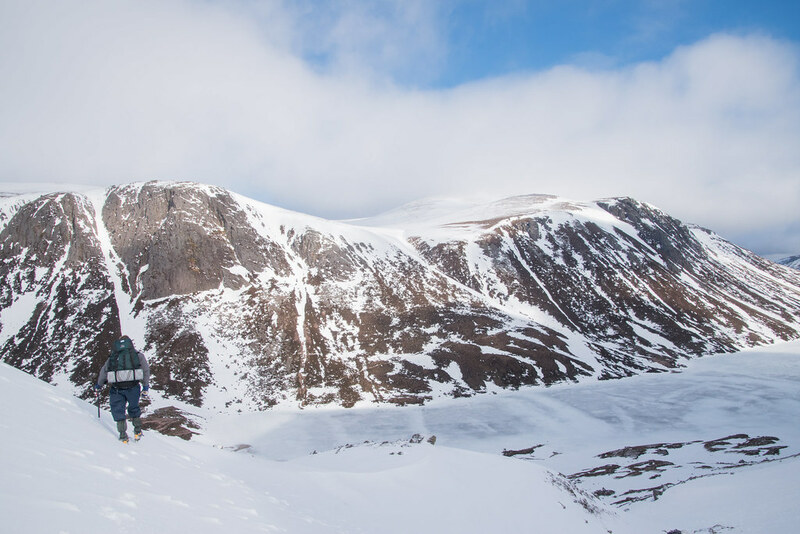 Beinn Mheadhoin in winter = sensational! On leaving Beinn Mheadhoin returning to the west side of Loch Avon the next real challenge of the day seemed even more insurmountable than the granite tor. 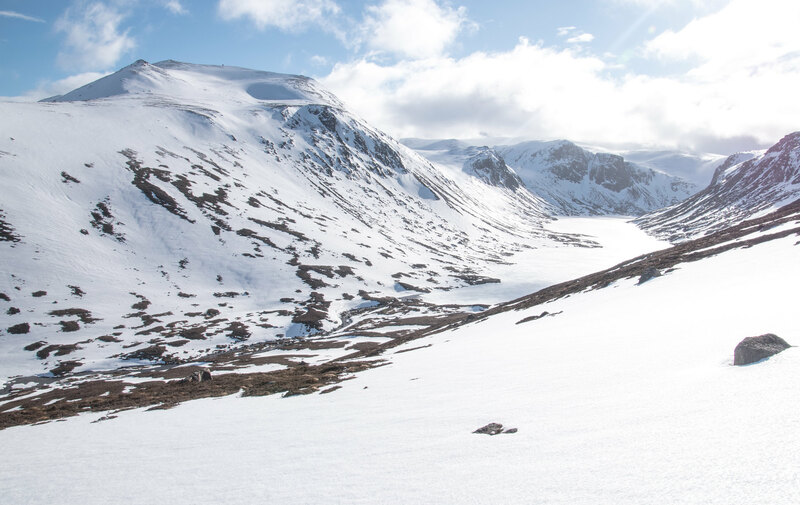 My fears were always that the route up from Loch Avon to Cairn Gorm could be problematic with some overhanging cornices or risk of avalanche but I was not keen on the long detour back to the east side of Loch Avon to head up The Saddle. 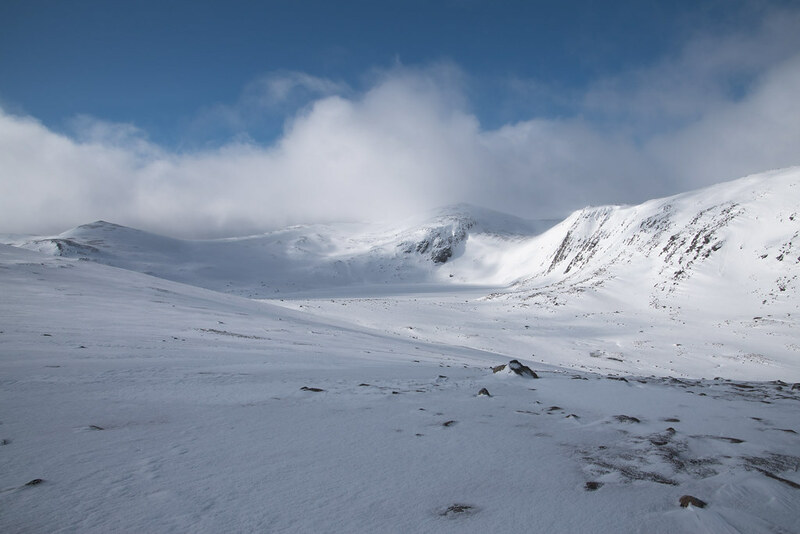 From where we were standing the planned ascent up Allt Coire Raibeirt looked to be holding too much snow to even contemplate but there was a long line of snow just east that looked possible. As it turned out we did indeed manage to successfully navigate up the “red line” but it was steep and I would not have fancied dropping anything on the route up there! 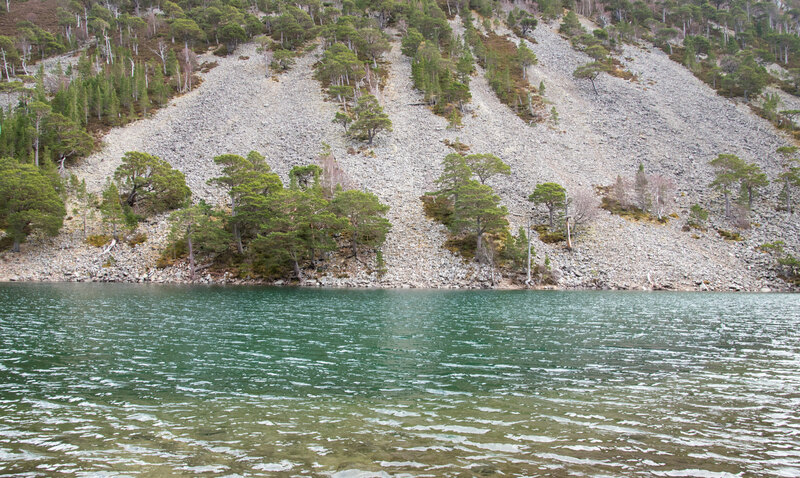 The uncertainty of whether or not we would manage at the time did make the already difficult route down to the west end of Loch Avon even more energy zapping. One saving grace was that the views were immense. Although the clouds were beginning to creep in they seemed to keep moving in the right direction. 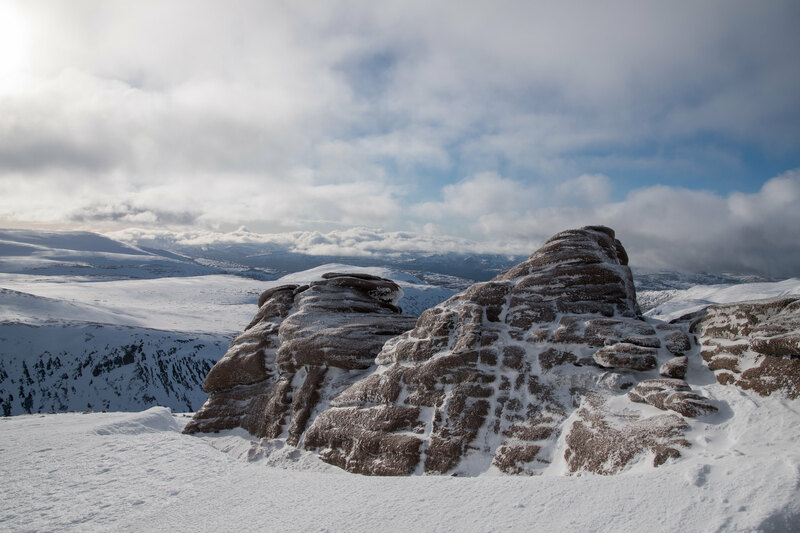 I was not too bothered if the came in by the time we reached Cairn Gorm as I have technically already seen the summit on another winter skills course. 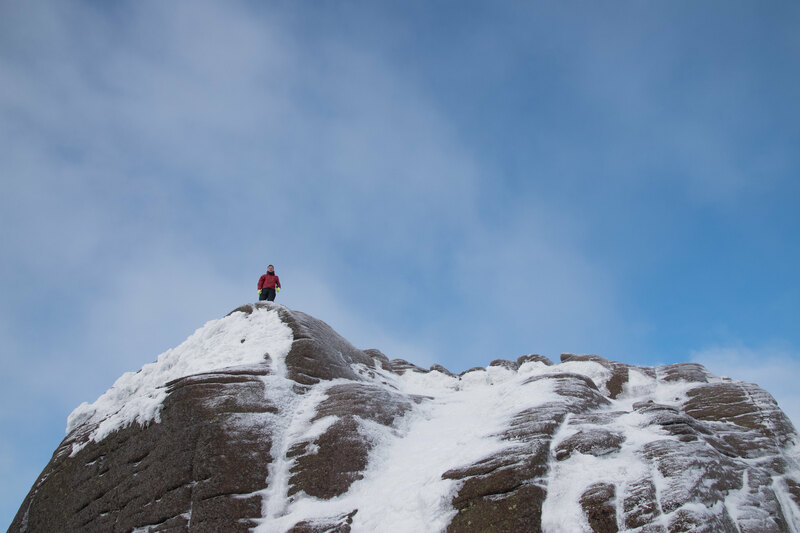 Plus two out of three winter summits in perfect conditions is not to be looked down on. Once down along side Loch Avon the sun was absolutely beaming down and the wind had being diverted elsewhere so it was lovely. 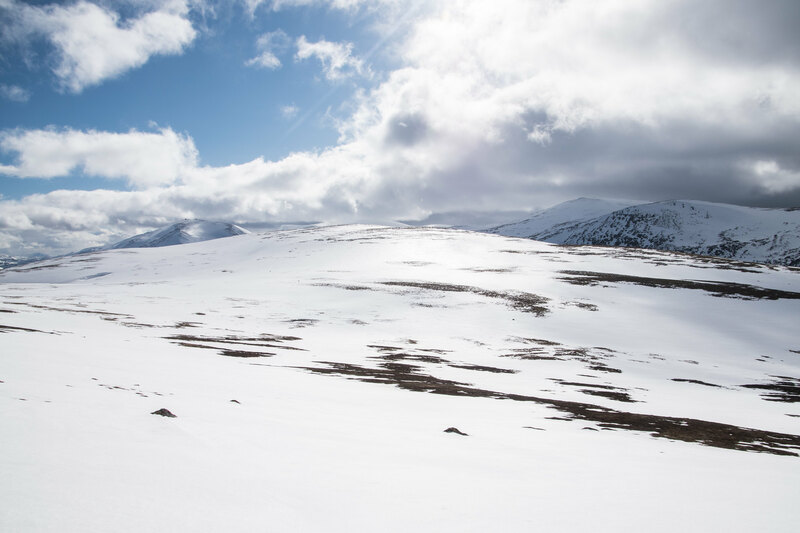 Even writing this months after the event I still remember thinking; even although we are so close to the hoards of people on Cairn Gorm skiing, the weather is beautiful, still in the event of an emergency this Loch would feel frighteningly isolated! We reached the bottom of the “red line” and it appeared much more walk-able than first feared so we both approved the decision to head straight up. 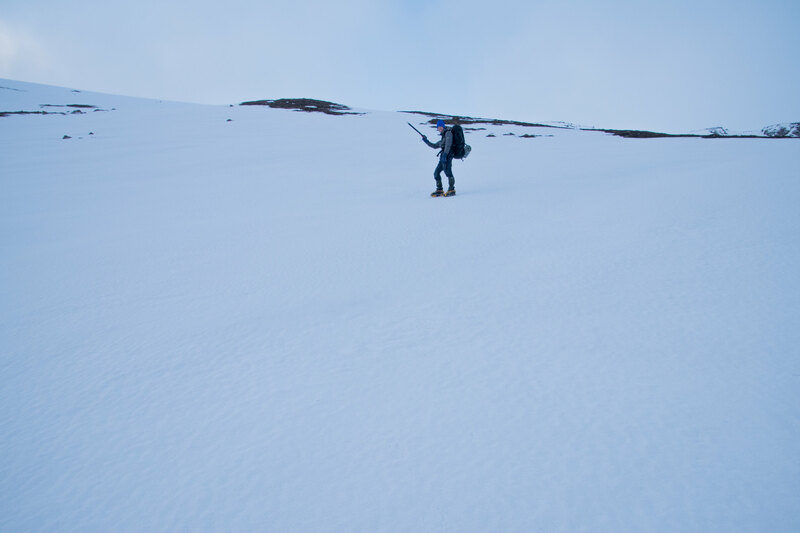 Progress was slow and tiring but the snow for ¾ of the route was perfect. By the final stages the sun has clearly began to have more of an effect and it was soft and uncomfortably unstable. I did not stop to take many photos, mainly in fear of dropping my camera that would have slid further than I would want to walk. 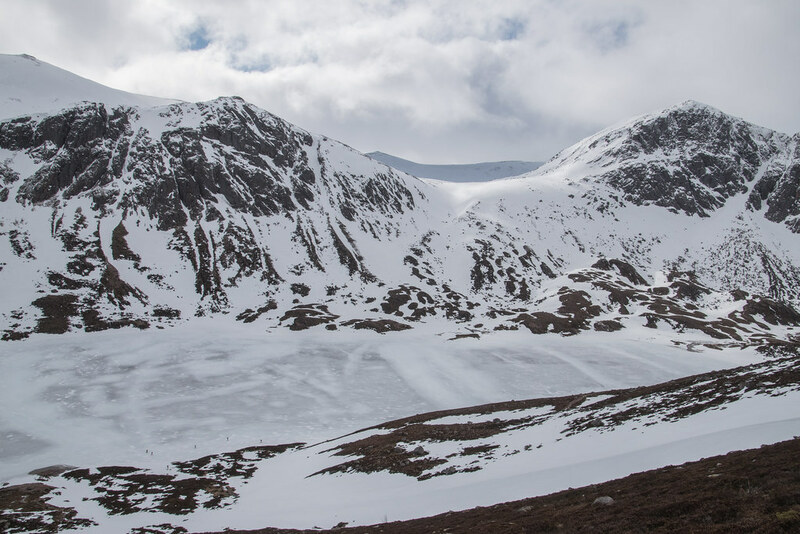 I did however have to take the risk to get a closer glimpse of the group of tour skiers making strides along the edge of Loch Avon. 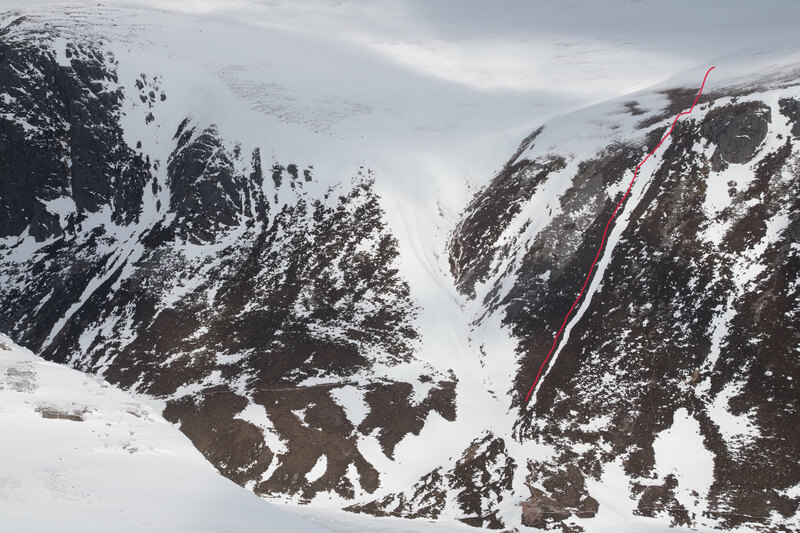 It was absolutely bonkers, I am sure they were safe and confident in the sturdiness of the ice but from this high up we could see how close they were skiing to rather wet looking ice patches – it’s a no from me! Once on the relative flat there was not too far remaining between us and the summit of Cairn Gorm, but by now it was clear our views were limited and the clouds were indeed going to win this summit. 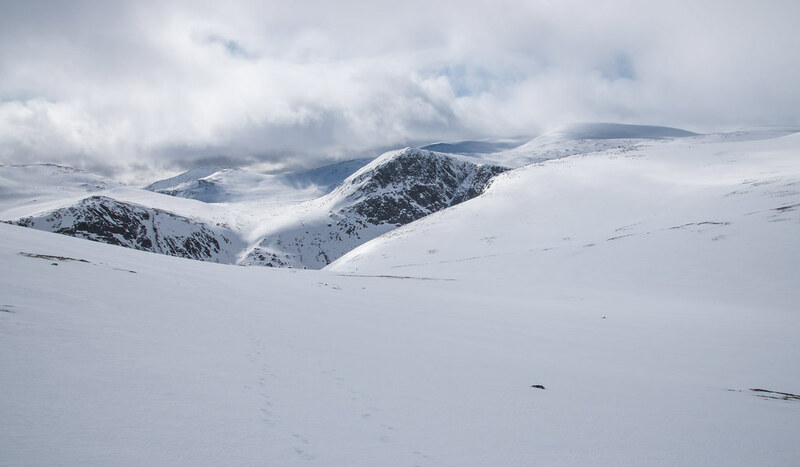 Thankfully we were gifted one final view towards Derry Cairngorm and Ben Macdui, just emphasising the vastness and size of these particular set of hills! 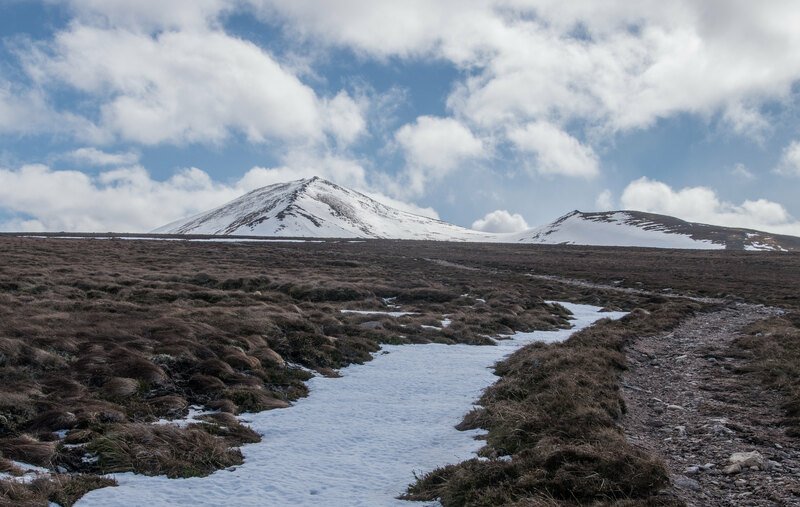 The two above photos were genuinely taken within 100m and about 2 minutes of each other – goes to show how quickly the weather in the winter hills can go to rubbish! 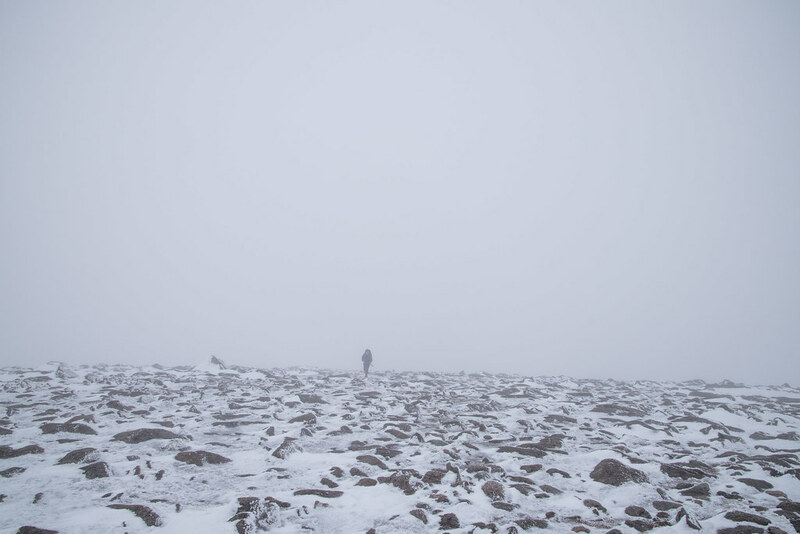 It was too cold, wet and windy to even begin conversation so we just made route towards the summit of Cairn Gorm where we were not even remotely greeted by the hoards of winter skills courses, which could not have looked more miserable if they tired! By now we were tiring but knew we still had the long walk back off the hills and down to the cars. There was also something intimidating about navigating in very poor visibility surrounded by those learning these vital skills! 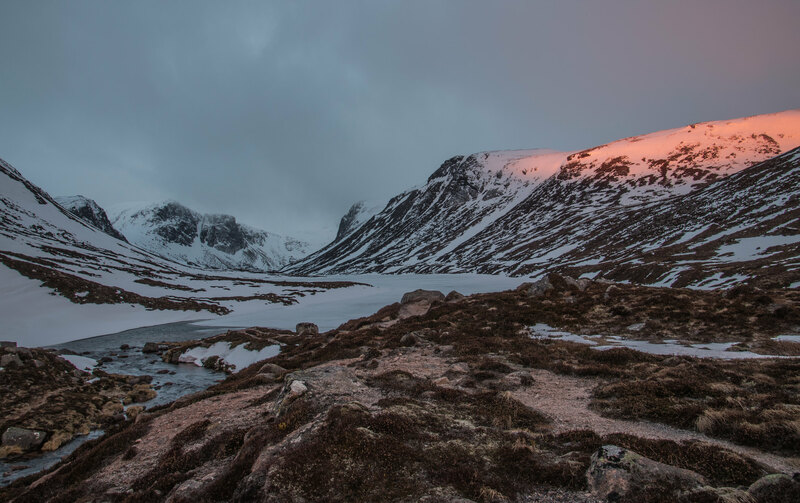 I know that no one person has more right to be on a particular hill than another, but after the peacefulness and friendliness of those on Bynack More, the remote night at Loch Avon, and the challenge of Beinn Mheadhoin reaching Cairn Gorm seemed like a massive disappointment. 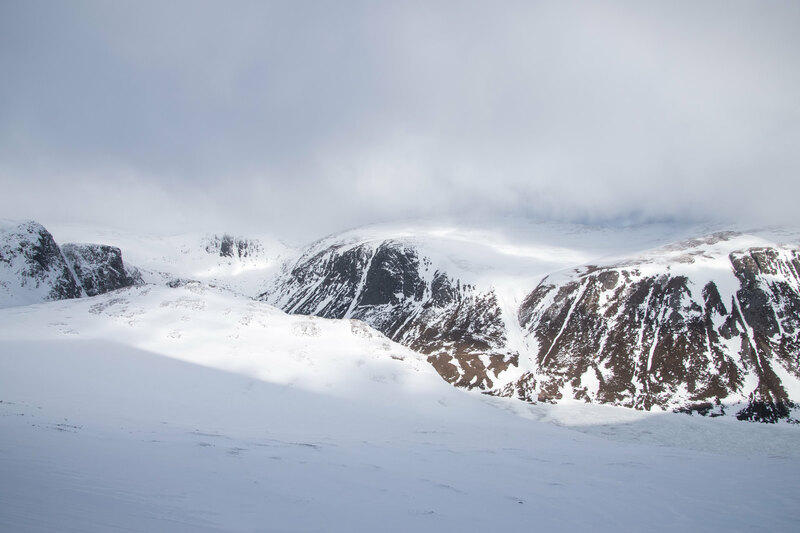 I am really reluctant to say what my favourite out of the 101 Munros summits I have reached so far, but I have no ounce of hesitation in saying that Cairn Gorm is my lowest of the low. 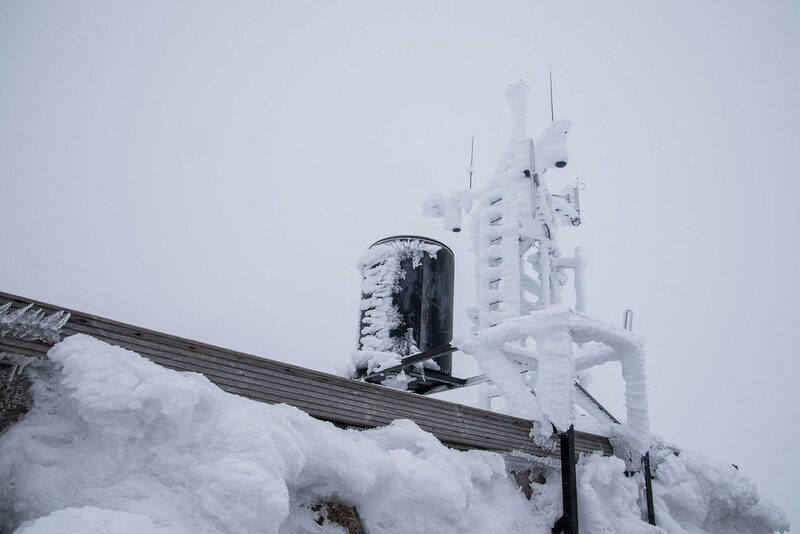 Forecast = cold. Frickin' cold! Our route back was following the skiers to the lower car park before heading through the forest and to the car. This was a long walk and one I wish we had an alternative to make. 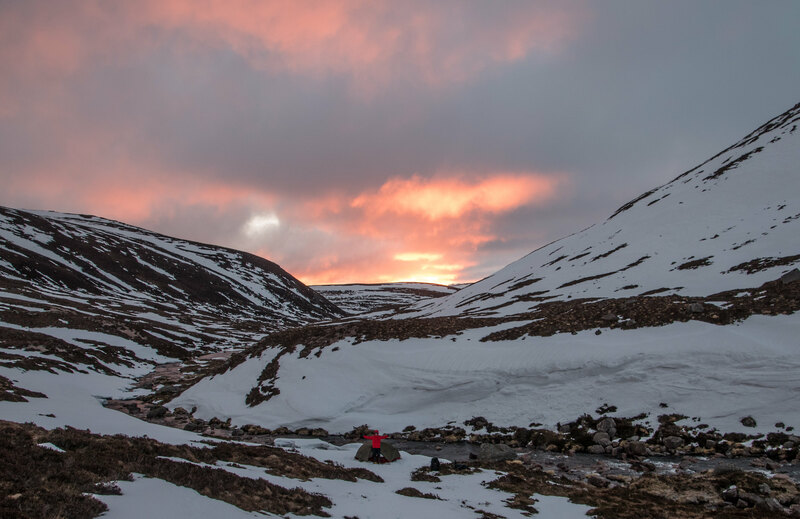 It would be easy to add a second car into this kind of outing but there is always something rewarding about a giant circular route, nights in the hills, numerous summits, giant rucksacks, and making it back to the car safe, albeit a little bit sore and tired. 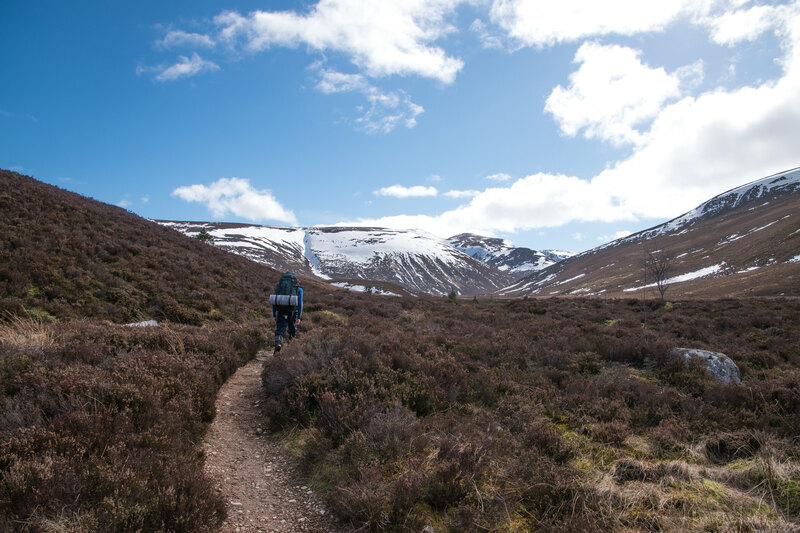 The route through the forest was challenging at best, the paths are disappearing fast – I dread to think if these are even passable in the height of summer! All my memory can recollect was thinking it was further than I had mentally prepared for and I was excited for my crisps in the car and taking off these boots! To summarise, even with my least favourite summit this has to be one of my best outings. It has everything I would want from a long winter trip and I just hope the photos and my account from it will do it justice when I come to read this back in decade’s time.